2017 is a significant milestone for Lifewater; we’re celebrating four decades as an active Christian non profit organization. Forty years propelled by the love of Christ to reach more than 2.5 million people across 40 countries with safe water, hygiene and sanitation. And we couldn’t have done it without you. We believe the success of Lifewater is rooted in generous people like yourself linking arms with brothers and sisters around the world to make significant change happen. The roots of Lifewater begin in the early 1960s in Southern California, when one man responded to God’s call. Bill Ashe, a California native and third generation water pump professional, responds to the call to serve the Mexican Fellowship Orphanage in Ensenada, Mexico. Despite a newly-dug well, residents and workers at the orphanage were carrying water long distances in buckets. On the first of many trips to come serve vulnerable people, Bill and his team install a windmill pump desperately needed by the community. While still working for his father at Shaw Pump and Supply, Bill continues to minister throughout Baja California, Mexico with his family and friends. In 1977, nearly half the world (2.5 billion people) live without safe water. That same year, Bill Ashe forms Lifewater as a Christian non profit organization composed of water resource management specialists ready to address the water needs of missionary agencies. Lifewater is one of fifteen ministries and the only Christian non profit organization to exhibit at the Billy Graham conference in Amsterdam. Over the course of the event, Bill Ashe receives more than 2,000 requests from pastors and evangelists for safe water from over 100 countries. From the thousands of requests received at the Billy Graham conference, Lifewater selects 37 as the most likely places in the world to begin projects. Already established as a Christian non profit organization, Bill and his associates formally register Lifewater, Inc (DBA Lifewater International) as a California Non-Profit Corporation. 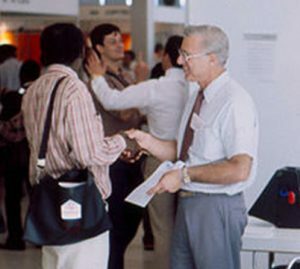 In 1988, Lifewater holds its first conference inviting volunteer professionals to become a part of the team. Lifewater continues to build an exceptional team of field trainers. One of Lifewater’s core values today is “Taking a Long View.” The seeds of that value are planted in 1990, as Lifewater develops a long-range purpose of helping US-based teams learn how to train and equip in-country instructors to train crews in their own countries. 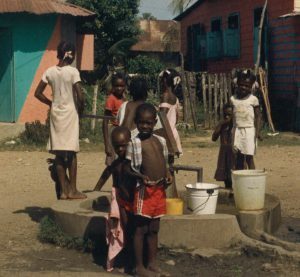 Haiti was one of the first countries beyond North America where Lifewater began serving in 1980. By 1994, there are at least six different ongoing projects throughout Haiti. The small Lifewater team is overloaded with requests for projects in the 1990s, and Bill recognizes the need to hire some extra help. Patricia Hettinger (now Klever), a surface water hydrologist, and geologist Fred Proby are the first to join the Christian non profit organization. Field trainers teach hygiene and hand pump repair programs. These new areas of expertise helped Lifewater train indigenous partners and increase impact and sustainability in communities. Bill Ashe returns to Haiti in 2001, more than 20 years after his first trip in 1980. Walking through villages where he had labored two decades earlier, he sees firsthand the powerful “word and deed” results of their efforts and God’s faithfulness to those whom they’d served. Lifewater adopts water access, sanitation, and hygiene (WASH) strategy focusing on community development and building the capacity of indigenous partners. In 2003, Lifewater helps found the Millennium Water Alliance (MWA) to share knowledge and work with other WASH organizations to advocate for the poor. By 2006, WASH curriculum developed by Lifewater sets the standard for Christian WASH practitioners in the field. In a continuing commitment as a Christian non profit organization to train volunteer staff from churches to work in the field and “train the trainers,” Lifewater establishes a training center near the office headquarters in San Luis Obispo, CA. The first pump repair class is hosted at the training center later that year. Using momentum and local knowledge to maximize impact, Lifewater adopts a regional program strategy aimed to serve tens of thousands of people with safe water, sanitation, and hygiene. Throughout the decade, Lifewater rolled out a WASH-centric approach to thousands of vulnerable people in 46 countries. Started in 2009, Project Restoring Hope provides safe water to 110,000 people in the Lira District in northern Uganda, a region rebuilding from decades of war. Along with water, LIfewater teams provide bathrooms, WASH training, and integrated water management education for communities Ogur and Abako sub-counties. Lifewater launches a modern, updated brand and logo, as well as a brand-new website. Lifewater introduces an engagement model that is the culmination of 38 years experience as a Christian non profit organization focusing on water access, sanitation, and hygiene (WASH) and exhaustive research of best practices in Christian community development. Vision of A Healthy Village centers around sustained relationships; local community health mobilizers walk alongside vulnerable children and families to overcome all forms of water poverty until a community is certified as a Healthy Village. Lifewater rolls out the Vision of a Healthy Village strategy, launching its first field offices in Ethiopia and Uganda staffed by Christian nationals. At the same time, local staff are equipped with Android devices to monitor, evaluate and upload field data in real time to help implement the Vision of a Healthy Village strategy. Trainings, water well installation, construction projects, school WASH clubs, and Healthy Homes are all tracked in our database and visualized to help monitor and evaluate program quality. All information is reviewed by headquarters for quality control and consistency, then shared online at Lifewater.org. After rolling out the first Vision of a Healthy Village program in Ethiopia two years prior, the proof of concept come to life as dozens of communities are certified healthy in Ethiopia and Uganda. As the Vision of a Healthy Village model gains traction, Lifewater continues to expand in hard-to-reach places in Africa and Southeast Asia. To date, the program has served more than 32,890 people and resulted in 2,741 healthy homes.